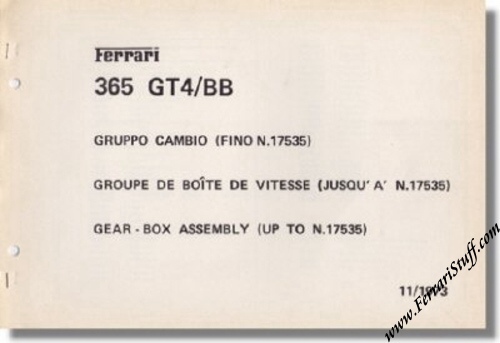 >Ferrari 365 GT4 BB Berlinetta Boxer Gearbox Assembly Parts Catalog Supplement, November 1973. This is a supplementary section for an original parts book, relating to the 365GT4BB, the first in the Berlinetta Boxer road-car series. There are just 6 pages of diagrams with part numbers and technical sizes / measurements, and relating only to the Gearbox Assembly on vehicles up to Chassis Number 17535. The pages are numbered 20/A, 21/A, 22/A and 23/A, which mirror the pages 20, 21, 22 and 23 in the full parts manual 89/73. The pages are held together with a staple, but are hole-punched in readiness to put into the main parts book preceding this date. There is not a factory catalog number printed on any of the pages, but the front title page is clearly dated as "11/1973" - November 1973.